1.If not already done the factory front sight must be removed for install. 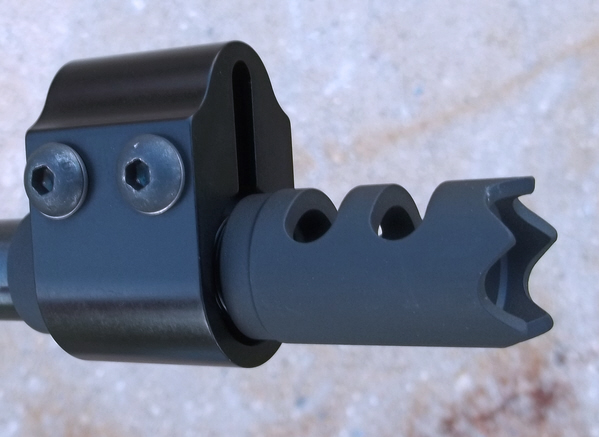 I removed mine by cutting off the plastic sight from its metal bushing with a dremmel tool. Then if your adapter requires the metal bushing to be removed (all adapters but one does) then remove the metal bushing from the barrel. I used a heat gun set at 800 degrees and heated the bushing for about 4 minutes at which time the bushing easily slid off and the residue from the loctite that held the bushing on could be wiped clean . Some have used a flame directed on the metal bushing (not the barrel as to not discolor it). 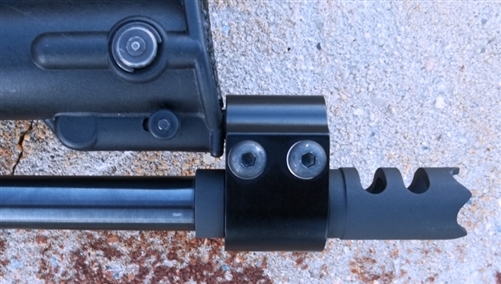 2.Slide adapter onto the gun (non-muzzlecomp adapters go longer solid circumference end first) and all the way against barrel step shoulder or in the case of the non-muzzlecomp adapter that allows the factory sight metal bushing to be left in place slide till it bottoms out on metal bushing (lip in adapter ID). 3.Orient so that the longitude (parallel to the barrel) milled slot is at 6 o'clock on the barrel. Place the adapter clamp over the adapter and orient so that the radial milled slots are evenly revealed in front of and behind of the adapter clamp (This should place your sight in the right position length wise on the barrel for folding and locking). Snug clamping screws till everything is snug but can still be moved around. 4.Make sure the adapter clamp is lined up radially to accept the buttstock detent and tighten bolts to 6 ft/lbs. 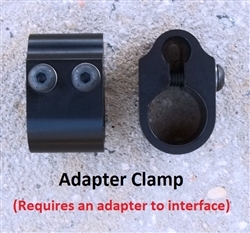 For those who do not want a front sight but would like to attach an adapter or just want to retain the folded locking feature of the gun without a front sight. Requires an adapter to interface to the gun.